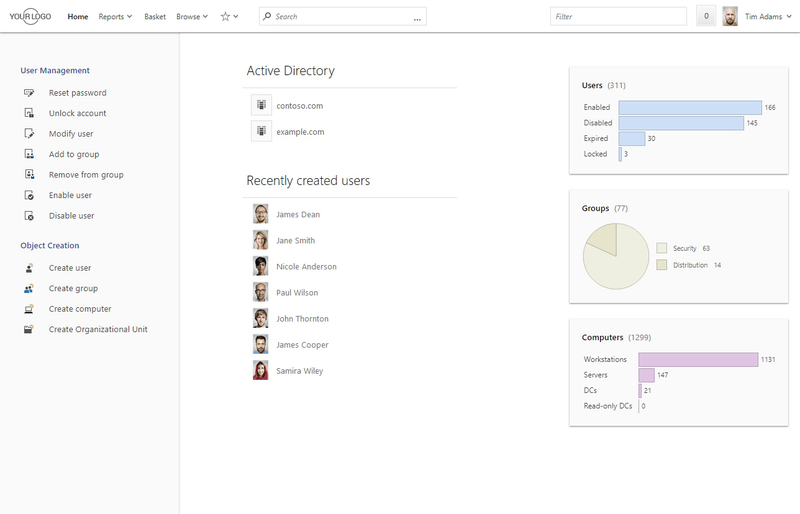 One of the key benefits of Adaxes Web Interface is that it’s fully customizable. It provides a great level of flexibility allowing you to control which operations are available to users and how those operations are executed, define which objects they can view and edit, limit which parts Active Directory users can browse and much more. To blend Adaxes into your corporate environment, you can change the way the Web Interface looks. To do that you can set your own colors for accent elements and backgrounds, display your logo, change the footer content, set a custom favicon, etc. You can also change any texts in the Web Interface and add your own translations to any language. Adaxes allows you to customize the content on the Home page according to the needs of different users. For example, you can provide your IT staff with quick access to various lists of AD objects, most used actions, reports, etc. At the same time, your help desk staff might not need all that. So, you can configure their Home page to have just the operations they need to execute on a daily basis and nothing else. In the Web Interface you can control which objects are visible to users when browsing Active Directory. For example, you can restrict them to browse only the objects located in a particular OU or domain and hide the rest of the AD structure from them. In addition to that, you can allow users to see only the objects that satisfy certain criteria, e.g. you can hide disabled and expired user accounts, show only the groups that contain the word Department in their names, etc. 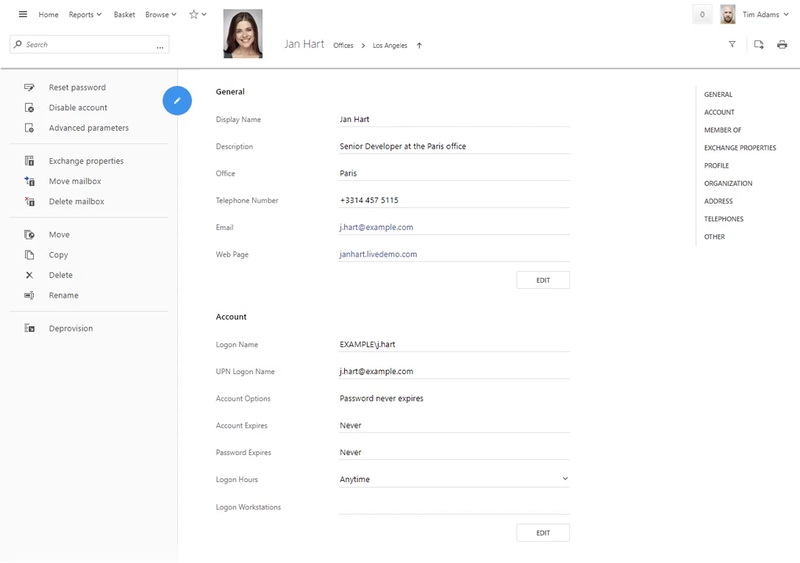 You can also control how different AD objects, like user accounts, computers, groups, OUs, contacts and others are displayed in the Web Interface. For example, you can determine which fields are visible when viewing a user account, how they are grouped, whether specific sections like Member Of, Exchange Properties or Office 365 are displayed, etc. Adaxes allows you to configure the forms that users interact with in the Web Interface when creating or editing AD objects. For example, you can provide users with a simplified user creation form by removing certain fields from it, adding custom hints and help pop-ups, providing drop-down lists for certain fields, etc. You can also enforce your corporate data standards by, for example, providing format restrictions for properties like Employee ID or Telephone Number and making fields like Description required. 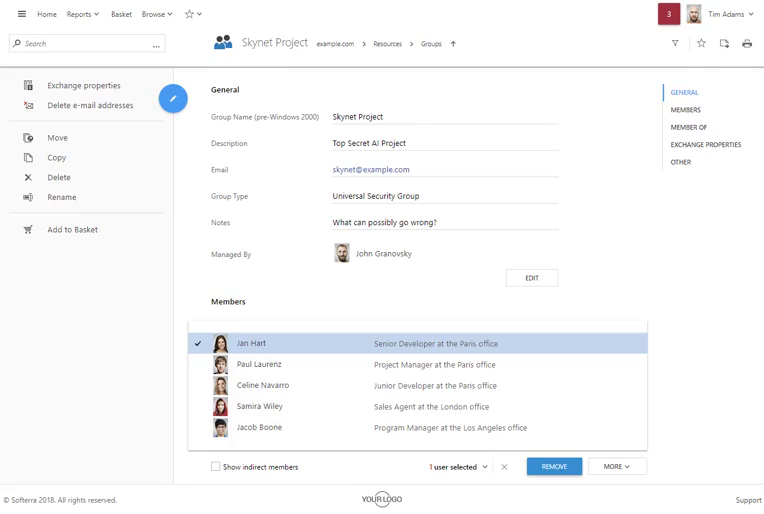 In addition to that, you can also customize the execution process of any operation in the Web Interface. For example, you can configure the password reset operation for your help desk staff in such a way that they can only execute it for the users in a particular OU and disallow them to uncheck the ‘User must change password at next logon’ checkbox. Also, if you want to delegate user creation to non-IT users, you can simplify the operation for them. For example, you can remove the step which the AD location for the new user is selected on. Instead you can let Adaxes automatically put the new account to the correct OU according to the rules you define. This way you can give out an interface which can be operated without any specific technical skills or knowledge of Active Directory. There are many more things that you can customize in Adaxes Web Interface. For more information about them, check out the Web Interface customization tutorials.